Quora is one of the most popular question-answer websites in the world. It's a platform where you can ask any topic related questions and get quality answers by its community of users. Although Quora is free to access by all people but sometimes it forcefully asks you to login. You have to login first to access the full website's content. That doesn't make sense. 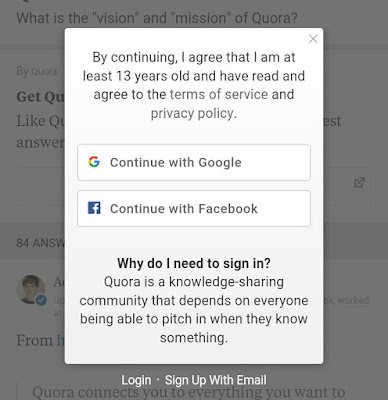 Although you can sign up on Quora with your existing Google or Facebook account but why you should login when you just want to read those answers? Here I have 3 simple tricks by which you can bypass this restriction and access full Quora's website without logging in. Simply add https://googleweblight.com/?lite_url= before the URL of webpage you want to open in GoogleWebLight version. For example, it you want to open https://www.quora.com/Getting-Started-on-Quora-What-is-Quora in GoogleWebLight version, then you have to type in https://googleweblight.com/?lite_url=https://www.quora.com/Getting-Started-on-Quora-What-is-Quora in the address bar. Make sure to add https:// before the destination URL. Like GoogleWebLight, there is another similar method of altering the webpage URL. All you have to do is, just add ?share=1 tag at the end of the Quora thread's URL and and press the enter button. You have to add this tag only once and then you will be able to read any answer on Quora without signing in. When a user comes from Google or other sources like social media, Quora won't show any pop up box to login. You can access everything without any restrictions. Here's how you can make use of Google to access Quora's locked content. Whenever you get the login message, simply copy the URL of webpage and search it on Google. From the search results, open the same URL of the Quora's website. That's it. You won't see any pop up box this time. Enjoy reading the answers. Note that, if you will open any internal link of the Quora website, same login message may start appearing again. For example, when you will click any link from the related questions list. To open that webpage, again you have to repeat the same process by searching its URL on Google. 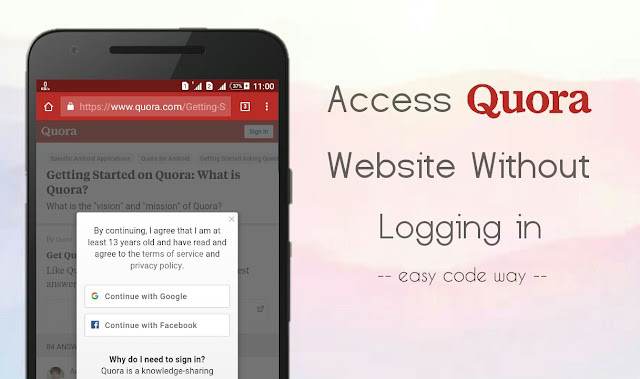 So these are few easy methods by which you can bypass Quora's login restrictions and read all answers without signing in. If you want to ask something, fell free to share it in the below comment box.